Notorious anti-Israel former MP George Galloway hopes to advocate for Palestinians if he wins London mayoral race next year. The former British MP George Galloway is back at his virulently anti-Israel tricks, telling BBC1 on Sunday that he plans to use his hoped for position of London mayor to rally support for the Palestinian cause. According to a Jewish Chronicle report, Galloway does not plan to name the British capital an "Israel-free zone," as he did to the constituency he used to represent, but rather will use the job of mayor to promote his "moral position" on the Israeli-Palestinian conflict. “The mayor is not the pope and the mayor is not the president and he is not the prime minister or the foreign secretary,” the Respect Party leader was quoted as saying. “Of course, it’s unimplementable. 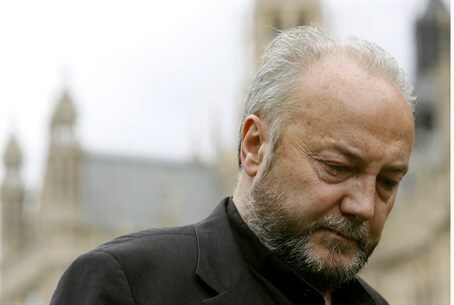 It is a moral position and my moral position on Palestine is well known," Galloway asserted. After losing his Bradford West parliamentary seat to Labor in last month's general elections, which he claimed "the Zionists" were celebrating, the radical leftist politician immediately announced plans to run in London's mayoral race next year.